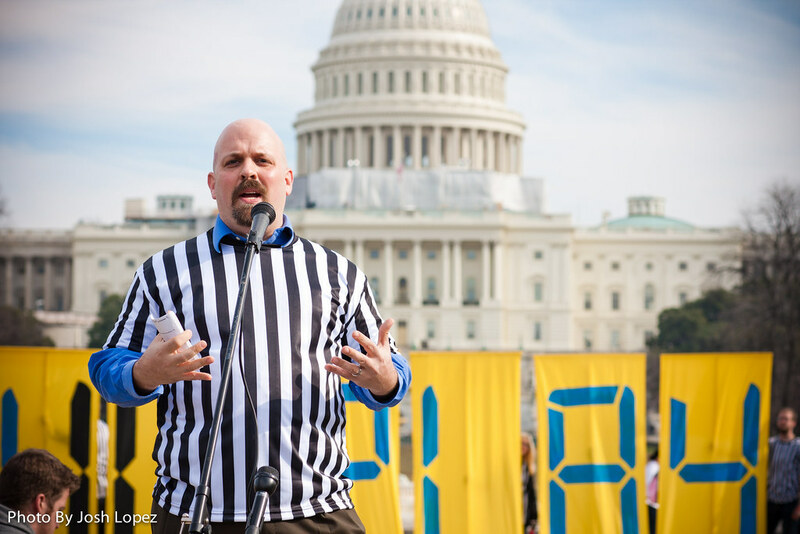 Greenpeace Executive Director Phil Radford speaking at a 350.org event last week about Big Oil corruption's in Congress and the Keystone XL tar sands pipeline. Posted on behalf of Phil Radford, Greenpeace's Executive Director in the U.S.
TransCanada has some explaining to do. Greenpeace just sent a letter to TransCanada's CEO, Russ Girling, as well as the company's board of directors asking for complete documentation of how it came to its inflated conclusions on Keystone XL pipeline jobs here in the U.S. That letter is posted in full below (click here to see it). We are following up on a letter Greenpeace sent to the Securities and Exchange Commission last week noting that TransCanada's job claims per mile of U.S. pipeline are 67 times higher than the estimates they provided to the Canadian government for its portion of Keystone XL. SEC notified us that our complaint was sent to their enforcement division. TransCanada has already bit back at our complaint, insinuating that Greenpeace doesn't know anything about pipelines. Perhaps TransCanada can explain why its existing Keystone pipeline leaked 14 times in less than 18 months when it anticipated a rate of 1.4 leaks per decade -- check out this infographic for descriptions of the first twelve leaks. Nebraska's ecologically sensitive Sandhills region and the Ogallala aquifer cannot be subject to TransCanada's insufficient pipeline safety standards, especially when that pipeline carries corrosive tar sands for almost 2,000 miles. And with well over 1,000 miles of pipeline proposed in our country, it's alarming that as little as 50 people may be employed to monitor and maintain it, as Cornell's Global Labor Institute suggests. Read the independent Cornell report yourself. TransCanada has also boosted its employment statistics by equating one job to one full year of employment for one person. This is part of how TransCanada and its allies inflated State Department estimates of less than 7,000 jobs, while the Cornell assessment concludes that Keystone XL could kill more jobs than it would create. Meanwhile, the American Petroleum Institute, the U.S. Chamber of Commerce and others are paying big for advertising campaigns that re-hash TransCanada's flawed 20,000 jobs claim, and from there claim hundreds of thousands of jobs from indirect employment. By indirect employment I mean services the oil industry isn't actually providing, which would would dry up after pipeline construction ends. I'm not saying temporary jobs don't count--we need all the employment we can get, which is why it's a slap in the face to the American people for TransCanada to grossly exaggerate its employment promises as if it's on the campaign trail and building Keystone XL is the inauguration. Tell it like it is, TransCanada, citizens seeking employment don't need to be teased after the 2008 economic recession. Unfortunately, the media is buying TransCanada's lies despite some reporting from the Washington Post and others that have already called the jobs numbers into serious question. According to Media Matters, 0% of broadcasters covering Keystone XL were critical of the jobs claims. Things weren't much better in coverage on cable news (11%) or print news (5%) either. Excluding USA Today and the Los Angeles Times, all major media outlets quoted more Keystone XL pipeline supporters than opponents. That's pretty bogus--Jack Gerard must have been popping the champagne over at the American Petroleum Institute headquarters as he put millions of dirty dollars to work through advertising campaigns like "Vote 4 Energy." It's ridiculous although unsurprising that TransCanada and Big Oil act as if pipeline jobs are the only ones that exist. Why mention that any dollar invested in a polluting, outdated, climate-destroying industry is better invested in creating jobs in the clean energy sector? Big Oil would never be that forthcoming. They'd rather keep Americans fenced within the Kingdom of Crude, where not only are they the most profitable industry on earth, but taxpayers still pay handouts for their multi-billion dollar operations. Greenpeace will continue demanding accountability from TransCanada and its Big Oil allies here in Washington, DC, and we'll let you know when we start getting some answers. “These groups have never built or operated a pipeline,” said company spokesman, Terry Cunha, to Politico. Mr. Cunha is correct; Greenpeace has never built a pipeline funneling corrosive tar sands crude oil across the heartland of the United States, endangering America’s groundwater, and then selling the oil overseas. What we do have experience in, however, is examining facts. Your claims just don’t add up. How will your pipeline create 67 times more jobs in the U.S. than your company told Canadian officials it would in Canada? Greenpeace calls for an end to destructive tar sands mining, which you must be aware is fueling global climate disruption and poisoning indigenous people in northern Alberta. Our opposition extends to projects like Keystone XL that aim to solidify continued decades of carbon pollution. I must admit that we probably won’t ever try to build something that will spill oil, threaten aquifers and create a several thousand mile-long terrorist target. However, you clearly do have such expertise, both in building pipelines and watching them spill, as demonstrated by 12 reported leaks in the first year of your existing Keystone pipeline’s operation. That’s why I’m inviting you to (possibly) head off SEC action and significant public embarrassment by explaining how TransCanada created such contradictory job creation claims. I invite you to provide a detailed, plain-language explanation of this remarkable difference in job creation rates. Several groups of people await this important explanation, including investors, dozens of politicians and pundits who have recycled your company’s fictitious job creation numbers, and SEC enforcement officials eyeing SEC Rule 10b(5) – Employment of Manipulative and Deceptive Practices. Greenpeace also would appreciate it if you could direct your contractor, Ray Perryman, to give a detailed accounting of the assumptions and methodology of the calculations he performed for your company on the pipeline’s supposed benefits. We’ll gladly post any detailed, credible explanation of this wide discrepancy in job creation numbers on our website. Sent by email, fax and direct mail. UPDATE: story covered in Yahoo News today. Recently, Greenpeace got a rare look behind the curtain at how Big Oil stages citizen support for huge oil companies, when activists got inside a TV commercial shoot in Washington DC. The American Petroleum Institute (API), and their PR firm Edelman, were filming a new series of TV commercials that we learned API plans to air nationally on CNN starting in January. The ads, aimed at the 2012 elections, will aim to demonstrate authentic citizen support for the oil industry's agenda. Greenpeace disrupted API's astroturf commercial plans by not following instructions and going off script, declaring support for a clean energy future and demanding an end political interference by the oil industry's lobbyists and PR firms. Details of the CNN January ad campaign as described by API and other clips are posted below. Late in the morning, the API Edelman team filmed three unexpectedly honest ‘citizens’ who made clear the script did not represent their real opinions on energy. Greenpeace researcher Connor Gibson of the PolluterWatch project repeated their scripted line, “I vote,” then declared, “But I am a clean energy citizen. I will not believe the lies and influence peddling of the American Petroleum Institute, which would leave you to believe that I am a citizen that is okay with giving my tax payer dollars to billionaires and millionaires that run oil companies, the most profitable industry on the planet.” Gibson stressed movement away from a “perpetual petroleum future” and finished his speech by telling Edelman Blue President Robert McKernan “we need clean sources of energy, like wind and solar.” Listen to Gibson's full declaration and read the transcript, below. In addition to Gibson, two other participants refused to recite API’s script. Peter Roquemore of the Sierra Student Coalition and Gabe Elsner, Deputy Director of the Checks and Balances Project showed up to the shoot with the expectation that they would provide their own assessments of American energy. Both decided not to participate once they were fed oil industry talking points on camera. In a taped conversation with the activists, an API communications advisor described the upcoming Vote 4 Energy advertising package in great detail: "This is scheduled to launch in January in a commercial on CNN, so it'll be a national spot...API—American Petroleum Institute—bought into an election package so anytime CNN does anything like covering the presidential debates, cover a caucus, anything like that, those will be the kinds of programs where the commercial is seen." The commercial debuts on January first. How much the deal with CNN cost remains an open question. The API rep also said, “we are shooting a ton of people so, you know, you may make the cut, you may not, it all depends on the demographic.” Earlier in the morning, API agents were overheard expressing a need for more people of color in the commercials, noting that black and Asian demographics tend to disagree with Big Oil's warped political positions. API has been caught in the past photo-shopping print ads to include racial minorities in purchased iStock Photo to make their already fabricated supporters appear more diverse. Over two years ago, Greenpeace obtained a confidential memo [pdf] from American Petroleum Institute CEO Jack Gerard, asking API member oil companies to support a campaign to fake a grassroots movement called “Energy Citizens.” Under the guise of this astroturf group, Big Oil would pay for public events similar to Tea Party rallies in support of their absurd wishlist: killing global warming legislation, unrestricted offshore oil drilling, increased tar sands development through the looming Keystone XL pipeline, hydraulic fracturing for “natural” gas, and no form of accountability for their immense contributions to climate change. Luckily, the leaked memo was revealed on the front page of the Financial Times and covered in the Washington Post, Guardian and on Huffington Post. The New York Times Editors called it "Another Astroturf Campaign," revealing what a fluke Energy Citizens was before Chevron had the chance to bus its employees to API’s first round of staged rallies, the majority of which were organized by oil lobbyists. 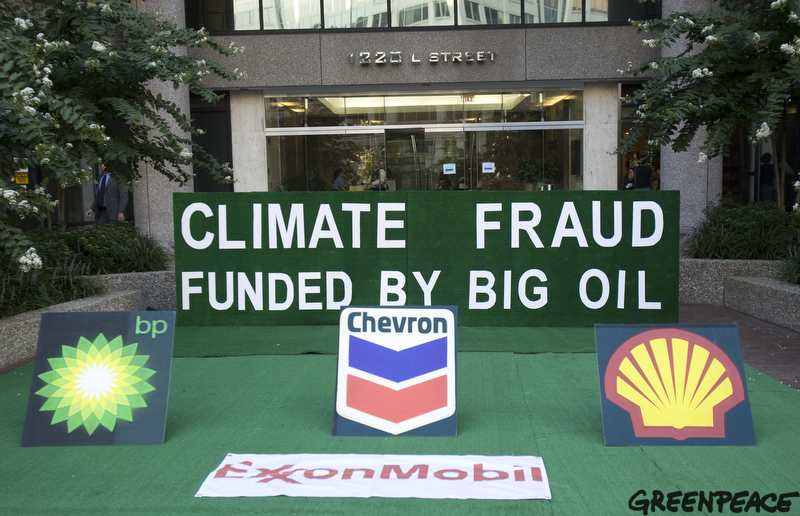 Greenpeace called attention to API’s tactic by installing astroturf on the front entrance of API’s Washington DC headquarters, featuring the logos of its largest members: ExxonMobil, Chevron, Shell, and BP and the banner CLIMATE FRAUD: FUNDED BY BIG OIL. Given the nature of API’s newest commercial shoot, its Energy Citizens rallies where participants had to be instructed to clap (see [Astro]Turf Wars), and its repeated use of iStock Photos to boost the perception of public support for Big Oil, it is reasonable to question the authenticity of similar PR moves like the “1’m One” or “One in a Million” advertising campaigns, also run by PR company Edelman, which purport to show real people who work for the oil industry. The American Petroleum Institute, the top lobbying firm for the oil and gas industry, has spent at least $30 million peddling its dirty influence to our federal government in the last five years, and recently announced it would start funneling oil money to politicians. With it's $200 million Big Oil budget, API has played a key role in the industry’s climate denial movement by funding junk scientists like Willie Soon and coordinating a public relations strategy to create doubt over climate change. API: "Just so you know, I don't know how much they told you, but this is scheduled to launch in January in a commercial on CNN, so it'll be a national spot...API--American Petroleum Institute, uh, bought into an election package so anytime CNN does anything like covering the presidential debates, cover a caucus, anything like that, those will be the kinds of programs where the commercial is seen." API: "And I'm sure they checked with you but you're a registered voter and all that stuff?" Gibson: "Yeah, they asked me. I don't know how you check that, but I am." API: "We, um...the only reason is really a lot of the, you know, the script is saying "I vote," "I vote for energy," "I vote for..." so, we at least want to be genuine in the sense that you are a registered voter. As you can imagine, there are some opponents of the oil and natural gas industry and so we always have to be very careful of, you know, what our opponents could use against us. And that is, you know, if they found out that we were using people who aren't actually registered voters, or not even eighteen, or whatever, so..."
Most of the time, polluter lobbyists manage to operate behind the scenes, pushing their agenda without public scrutiny. But today, newly published internal emails offer a glimpse into how a major tar sands polluter has been using insider access to get special treatement at the State Department. The emails, obtained under the Freedom of Information Act by Friends of the Earth, reveal improper conduct between State Department officials and Paul Elliott, a lobbyist pushing the tar sands Keystone XL pipeline for Transcanada. As the Washington Post reported this morning, the emails "show how Elliott tried to exploit relationships built in political campaigns, with mixed results. The e-mails are almost all between Elliott and a special assistant to Cheryl Mills, Clinton’s chief of staff. All three knew one another from working on Clinton’s presidential campaign." It's clear that the State Department's determination that the Keystone XL pipeline would have "no significant impact" on the environment is seriously flawed (see It's Easy to Find "No Significant Impact" if You Do No Significant Study...), and these emails provide some clues why. Instead of performing a rigorous environmental impact statement, a senior State Department official was busy helping TransCanada's CEO with "insight on what he'd like to see by way of on the record comment during this public comment period of this Keystone KXL draft environmental impact statement.” according to one email from Elliott. In yet another example of the revolving door between polluting industries and our public officials, that senior State Department official, David Goldwyn, is now himself a polluter lobbyist, and testified before Congress in favor of the tar sands pipeline. The State Department has clearly heard a lot from polluter lobbyists pushing tar sands oil and the Keystone XL pipeline. Let's make sure they hear from us: join Tar Sands Action on October 7th for a rally at the final hearing for the Keystone XL pipeline in Washington DC. We might not get special "insight" from the State Department about what kind of public comment they'd like to see - but I think we'll have some ideas of our own. The impact of fracking on clean water and health is questionable. Photo credit. Written by Kyle Ash, crossposted from Greenpeace USA. This morning, CEOs, founders, and other leaders of 68 organizations sent a letter to President Obama, urging that he do what he can to stop the dangerous extraction of shale gas that is occurring across the country without any federal public safeguards. Often called 'fracking,' communities from Pennsylvania to Texas to Minnesota are already suffering from the numerous environmental problems connected with this process to force “natural” gas from shale several thousand feet below ground. 'Fracking involves shooting millions of gallons of water laced with carcinogenic chemicals deep underground to break apart rock to release trapped gas. Despite its obvious hazards, regulation necessary to ensure that fracking does not endanger our nation’s water supply has not kept pace with its rapid and increasing use by the oil and gas industry. Fracked gas may be no 'bridge fuel,' and it certainly is not 'clean energy.' Burning natural gas releases about half the greenhouse gas as burning coal, but fracked gas may produce so much more methane during extraction and processing that it could be as bad or worse than coal for the climate. The oil and gas industry have good lobbyists, and have achieved years ago exemptions under virtually every federal environmental law, including the Safe Drinking Water Act and Clean Water Act. Companies like Conoco Phillips, Chesapeake Energy and Talisman Energy are not even required to disclose the more than 900 different chemicals used in the fracking process, which contaminate aquifers. Talisman has even targeted children in its lobbying, with 'Terry the Fracosaurus' who promotes an industry that is polluting drinking water with toxic chemicals. Oil and gas companies have spent over three hundred million dollars in the last two years lobbying against federal protections from their pollution, so it is not too surprising that the federal government has decided to 'shoot now, ask questions later.' There are few efforts by Congress and the administration to mitigate the public health impacts of fracking. In the next week or two we should see some results fom a panel of experts set up by the Department of Energy, which is supposed to reach conclusions on how to frack safely. However, the panel is stocked with only frack-friendly experts. EPA is studying impacts on water quality, but that study will take years to complete and is limited in its scope. While further knowledge about impacts is a certainly a good thing, in this case 'more research' means political procrastination. EPA found 24 years ago that fracking contaminates water supplies. So far the only legislation to get much traction is the 'FRAC Act,' spearheaded by Democracts from Pennsylvania, New York, and Colorado. This bill is an important step to closing one legal loophole in the Safe Drinking Water Act, and would require that industry disclose which chemicals they're using.